[ Earth Original Food Series ] "The earth" represents this land and is the source of everything. Food, it should be grown from this land. The earth also symbolizes a natural, primitive spirit. The minimalist design of the glass jar gives a pure and transparent visual sense. The contents are clear at a glance, like the four foods contained in the inside. Pure and natural, everything is done with the lowest processing, completely zero added, Seal the best taste of the food itself in the easiest way. Dry turmeric slices (autumn turmeric) 90g / can . A refreshing light taste, for the first time you try turmeric . More convenient to carry the flakes, to give you a busy life . More intimate and low-temperature drying, giving you a healthy and healthy diet. Cold bubble / hot bubble / cuisine / stew / drinking water added About, the most assured, we try to let you know the original appearance of food About, the nutritional value of turmeric, low temperature drying method to lock more beautiful ingredients ✔ More suitable for summer refreshing taste 低温 Dry at low temperature, lock turmeric nutrients 方便 Easy to carry dry sheet 「 "Autumn Yujin" variety with the highest content of curcumin ✔ cold bubble / hot bubble / cooking / stew / drinking water added ✔ No chemical additives, no preservatives, no pigments, no fragrance https://farm2.staticflickr.com/1785/41376436450_cbc5703a9c_b.jpg https://farm2.staticflickr.com/1827/43186840431_ea34c0da83_b.jpg https://farm1.staticflickr.com/843/28317630877_46e66e71a7_b.jpg https://farm2.staticflickr.com/1827/28317631417_7cf8175166_b.jpg █ Multiple peace of mind test Passed TUV without pesticide residue test certificate, SGS 251 no pesticide residue test, SGS no heavy metal lead, SGS no xanthine toxin, SGS no E. coli https://farm1.staticflickr.com/839/29314003178_c7863862bf_b.jpg https://farm2.staticflickr.com/1822/29314003448_c817ec4353_b.jpg █ How to save If you have not finished eating, please store the "sealed" glass jar (turmeric will corrode the plastic). Do not put it in the refrigerator, it is easy to get wet during the process. Please do not put it in a place with light, just put it in a cool place. █ How to eat Turmeric health tea / turmeric tablets 3~4 tablets, put into 400cc warm water, can drink after three minutes Cold soaked turmeric drink / 4~5 pieces of turmeric tablets, placed in 500cc of cold water, can be drunk after 10 hours of refrigeration 3~4 slices of turmeric steamed fish/turmeric tablets, put in a small cup of boiling water for 2 hours. After soaking, remove the turmeric slices and shred them on the fish. Cook the fish until cooked. 5~6 pieces of turmeric fried rice/turmeric pieces, put into a small cup of boiling water for 2 hours, remove the turmeric pieces and cut them (the finer the better), stir fry together with the fried rice ingredients until cooked. 3~4 slices of turmeric omelette / turmeric, put in a small cup of boiling water for 2 hours, remove the ginger yellow pieces, blot dry water and shred, and mix the eggs, ginger, and corn into egg liquid, then Cook in a pan to double-sided micro-focus. 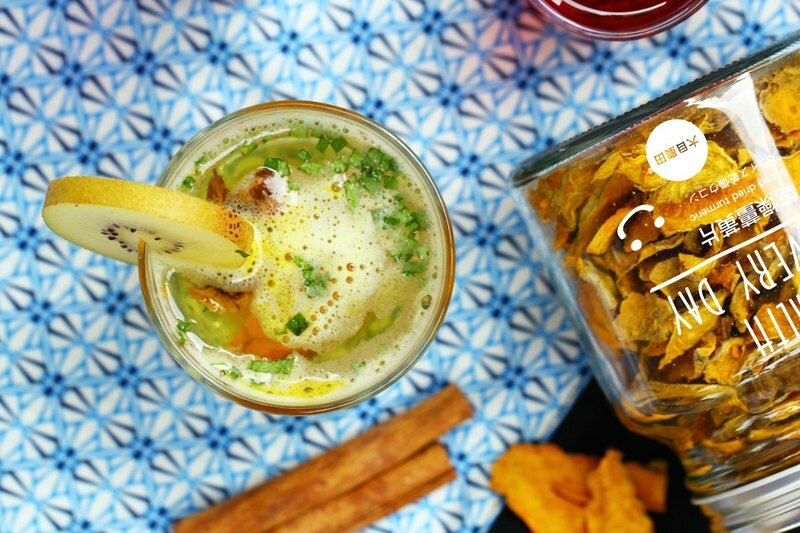 Turmeric Slice Soup / Turmeric Ginger Bubble Water / Lemon Honey Turmeric Drink / Drinking Water Add 2~3 Pieces of Turmeric / Turmeric Porridge https://farm2.staticflickr.com/1783/42468756814_a0b06802fc_b.jpg https://farm1.staticflickr.com/920/42468756954_4ccc6d1f05_b.jpg █ Product specifications ◆Product Name: [Dadi Original Food Series] Pure Natural-Dry Turmeric Tablets (Qiu Yujin Variety) ◆Commodity weight: 90 grams ± 5% ◆Commodity ingredients: autumn turmeric variety turmeric, no preservatives, no chemical additives (vegan) ◆Storage period: Store at room temperature for two years.